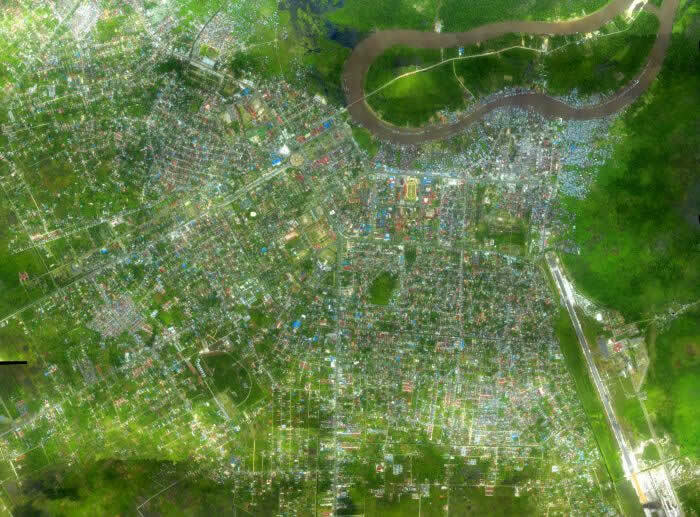 The city Palangka Raya was scanned with a LiDAR and a Hasselblad Camera 18 times with an overlap of approx. 50% in an average altitude of 500m on the 10. August 2007. The weather was good. Beside LiDAR data RGB-Photos were taken with a Hasselblad camera of 22MB image size (5440 x 4080). These RGB-Photos had in flight direction and to the side an overlap. For the 5km wide and 7km long area of Palangka Raya we collected more than 400 RGB-Photos. Some misalignments over the images were noticed. An automatic aerial triangulation process was used to generate an Ortho-Photo Mosaik. Next step was the Ground Control Point (GCP) measurements which were taken in the LiDAR data. This was carried out with the multi photo measurement tool. Most of those GCPs were found along road intersections since they are easy to find.